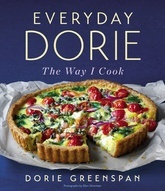 What makes a “Dorie recipe”? Each one has a small surprise that makes it special. The dishes are delicious but practical, made with common ingredients from the supermarket, farmers’ market, or pantry, like Sweet Chili Chicken Thighs, which is both weeknight simple and fine enough for company, and Eton Mess, a beautifully casual dessert of crumbled meringue, fruit, and whipped cream. They are easygoing, providing swaps and substitutions. They invite mixing and matching. Many can be served as dinner, or as a side dish, or as an appetizer, or hot, cold, or room temperature. And every single one is like a best friend in the kitchen, full of Dorie’s infectious love of cooking and her trademark hand-holding directions. Inducted into the James Beard Foundation's Who's Who of Food and Beverage in America, Dorie Greenspan is the author of Dorie's Cookies, a 2017 James Beard Award-winner for Best Baking and Dessert book; Around My French Table, a The New York Times bestseller that was named Cookbook of the Year by the IACP; Baking Chez Moi, also a Times bestseller; and Baking: From My Home to Yours, a James Beard Award winner. She lives in New York City, Westbrook, Connecticut, and Paris.